A local client brought me a radio which was in the family for many years, a cute little “fridge radio” made by Westinghouse from 1945-1947. The same year Westinghouse released this new model of home refrigerator, they also released this Little Jewel radio in the same style as a companion. 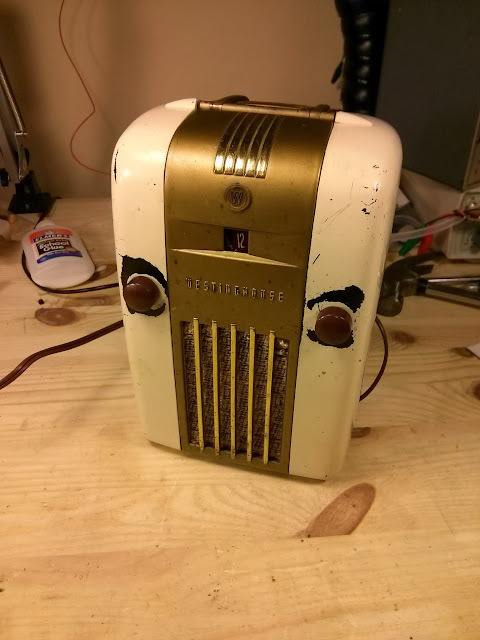 Many examples of this radio found their way into homes and kitchens over the years and are a great little collectible from the post-war era. 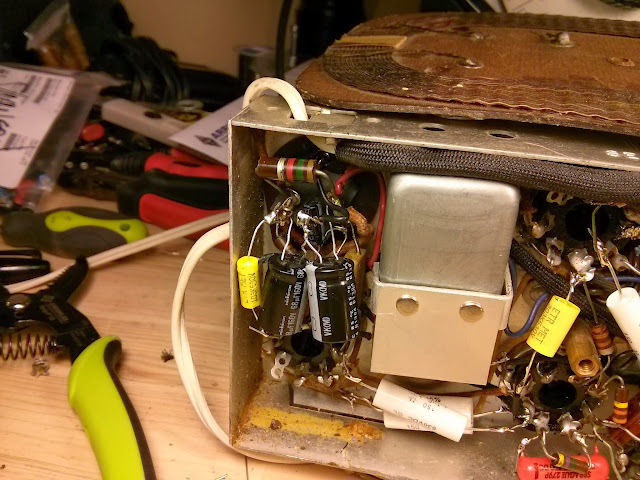 This little radio is a 6-tube AC/DC radio with a series-string tube line-up, 12SK7 12SA7 12SF7 12SJ7 35L6 35Z5. It has an integral tuned loop antenna and an RF Amplifier for great performance. They sure packed it into here, too. The radio is held in place by two chassis bolts, one in each side and a rod which stabilizes it in place. The dial scale has badly warped with age, but the grille cloth is nicely intact. 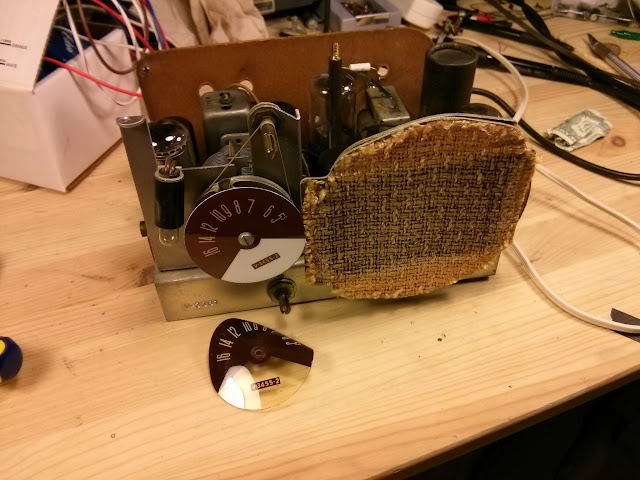 This radio’s owner mentioned that it had been playing but recently cut out. No surprise why – the original parts under the chassis looked to be in pretty bad shape! 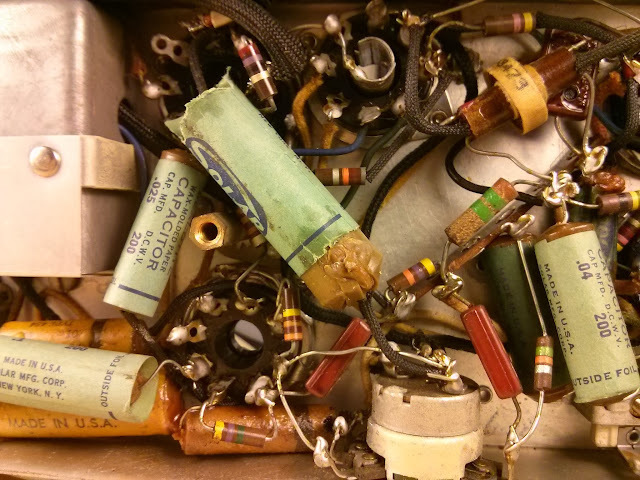 Melted, leaking and blown capacitors will cause all sorts of issues – no wonder it wasn’t running like it used to! 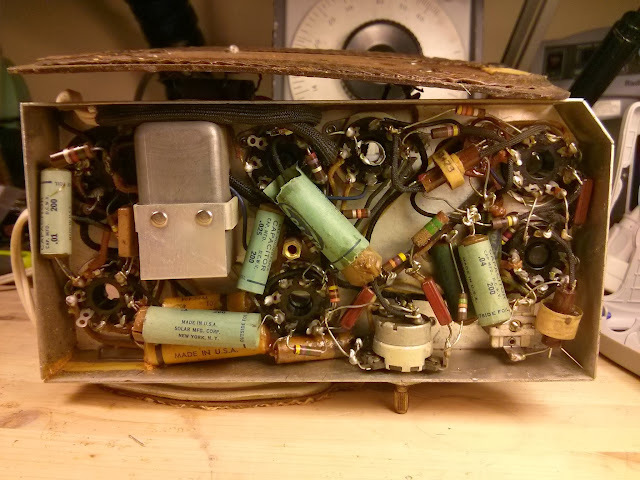 This radio was pretty cramped underneath the chassis, but there was enough room to install both electrolytic filter capacitors and the cathode bypass capacitor on the output tube under the chassis instead of needing to re-stuff the can on top. 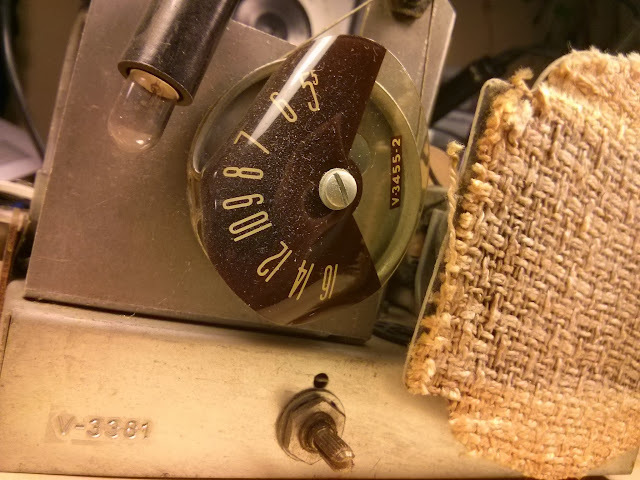 I had a reproduction dial scale made up to replace the warped original, and replaced some tubes which were testing weak. 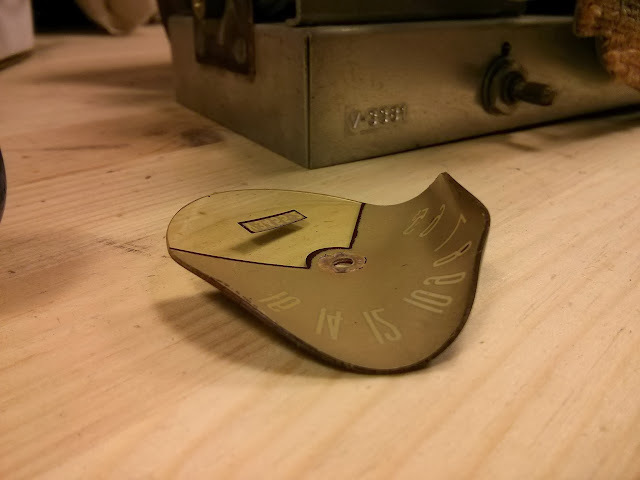 Finally, it was time to test it out and tweak the alignment trimmers, then back together! 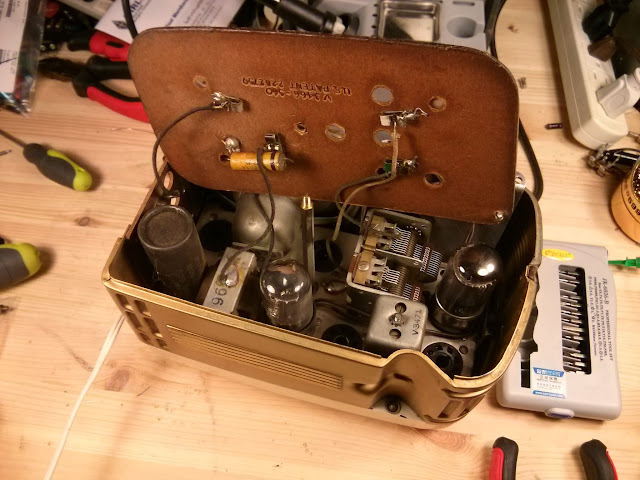 It sounds a lot better than I’d expect with such a small radio – the case makes an interesting vented enclosure. On 880 KIXI, you can really hear the low notes, and the vent on the top seems to serve as a port for the speaker. 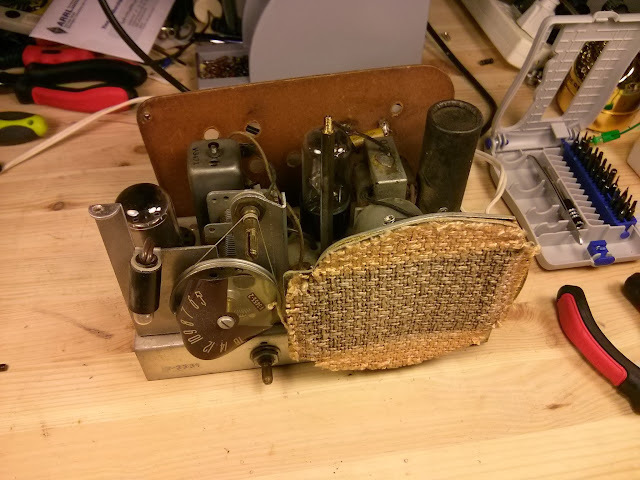 After being refurbished electrically, this radio is going to perform beautifully for many years. It’s got a rich tone and great audio clarity even more than you might think from such a small speaker. 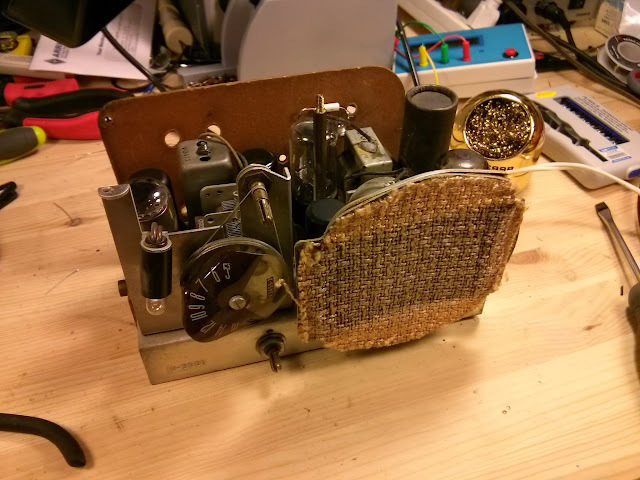 This entry was posted in Projects, Radios and Tubes, Vintage and tagged antique radio, capacitor, capacitor replacement, Fridge, Fridge Radio, H-126, Little Jewel, radio, Refrigerator, Refrigerator Radio, repair, restoration, tube radio, vacuum tube, vintage, vintage radio, Westinghouse. Bookmark the permalink. 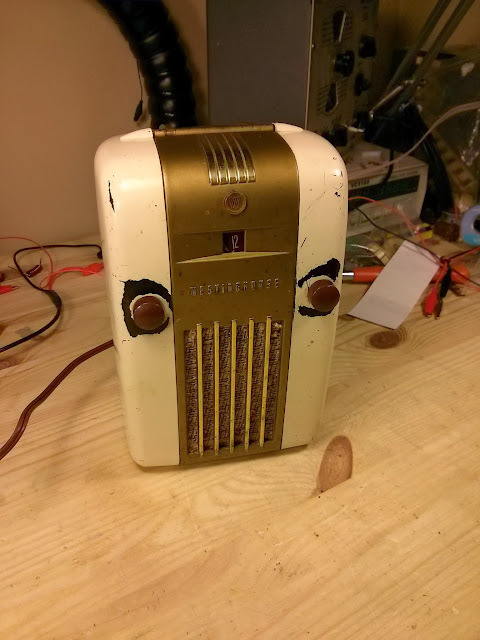 I’m looking for a Westinghouse H126 Little Jewel Radio Ivory color. My wife wants it as a reminder of her Grandfather who listened to his all the time when she was a little girl, many years ago. 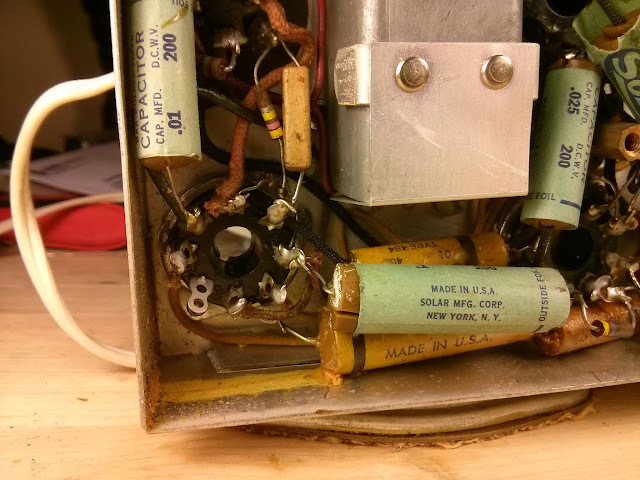 Great video on the H-126b radio, I do have a question on the Filter Capacitor when you installed the new capacitors (47 uf & 22 uf ) did you cut all of the filter contacts and leave the Can terminal connected or did you cut all three of the contacts of the filter cap. I see you haven’t gotten a reply yet, but i always cut the leads to the old capacitor and just leave the can for aesthetics. 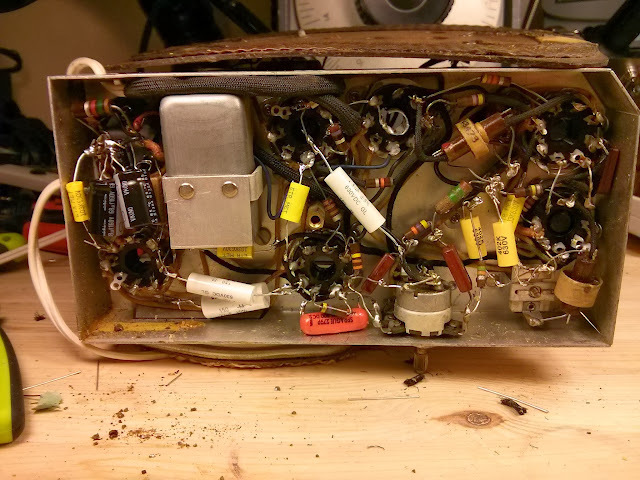 Cudos to the author, great restore page. Hope he doesn’t mind my comment.